Transition from one scene to the next with stylistic parallaxing panel transitions from Pixel Film Studios. With TransPivot users have up to 128 fully customizable transitions all within Final Cut Pro X. Each users has total control over media rotation, rotation speed, panel colorization, panel media scale, panel width, text, text masks, and more all within Final Cut Pro X. Transition from one scene to the next with transitions that pivot and parallaxing text. With TransPivot users can select from up to 128 fully customizable, simple and easy to use, stylistic panel transitions all within Final Cut Pro X. Users have total control over media rotation, rotation speed, gradient colorization, panel media type, text, and more. 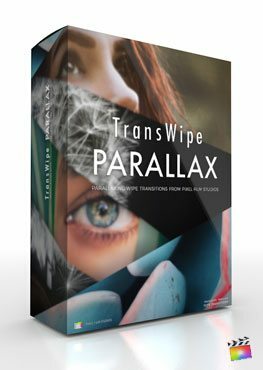 TransPivot offers up to 128 fully customizable transition effects. With TransPivot users can select from transition categories such as singles, doubles, singles to doubles, and doubles to singles. Users have the option of two styles of rotations and have the ability to customize each preset with a click of mouse all within Final Cut Pro X. With TransPivot each preset is fully customizable all within Final Cut Pro X. Each user has total control over media rotation, rotation speed method, panel media start and end type, panel media scale, panel width, panel color gradient, text, text mask, and more all with a click of a mouse. With up to 128 fully customizable presets the possibilities are endless. TransPivot was professionally designed to work seamlessly inside of Final Cut Pro X. As a transition effect, each TransPivot preset can be dragged and dropped onto media and previewed in real time. With the published parameters found in the FCPX inspector, users have the ability to make further adjustments with just a few clicks of a mouse. Where do I find TransPivot? Once the installation is complete, you can find TransPivot in the FCPX Transition library.